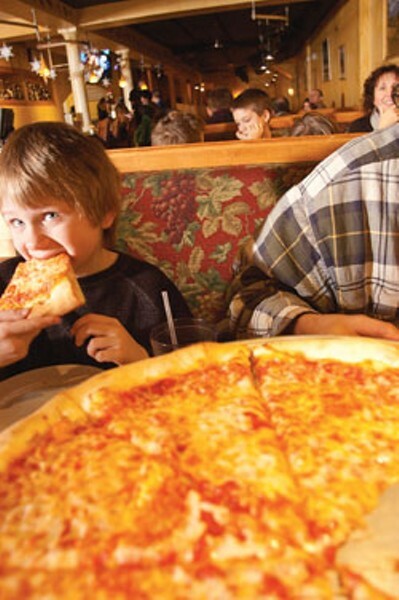 Mimmo's Pizzeria | Out to Eat | Kids VT - small people, big ideas! Our recent restaurant adventure began with my family violating one of the cardinal rules of dining out with young children — avoid the dinner rush. Instead, we picked a busy St. Albans restaurant (Mimmo's Pizzeria) on their busiest night (Friday) at their busiest time (6 p.m.). And, we happened to pick a night when a youth hockey tournament was in town, making the place a madhouse. Oops. Of course, in a madhouse, no one notices your small child struggling to contain himself. My husband, Kevin, and I don't eat out often because our 3-year-old, Oliver, is what you'd call "active." Getting him to sit still is a challenge akin to containing a thermonuclear reaction. Sitting still in a restaurant ... well, we just don't try very often. But our experience at Mimmo's was terrific. We got started on the right foot when we called to check the wait time and they suggested we order in advance so that, even if the table wait was long, the food wait wouldn't be. Great idea! I highly recommend trying this approach. You'll need to be familiar with the menu — or find it online in advance — and it takes some of the spontaneity out of ordering, but I didn't mind the trade-off. When we arrived, the place was packed and the line stretched from the counter to the door, but we were seated within 10 minutes. While we waited for a table, we watched the pizza makers throwing dough. Mimmo's has a counter with stools overlooking the prep area. There's also a small, comfortable padded bench in front of the window that looks out on the street. Plus, there's a basket of toys, puzzles and games to keep kids occupied. But it was the pizza that fascinated Oliver. Kevin must have gotten up six times before, during and after our meal to take him up front to watch the pizza dudes trying to keep up with the rush. When our garlic-knots appetizer arrived, we sat down and pulled out the small toys that we always bring when we dine out. Normally, Mimmo's provides diners with coloring supplies as well as a small ball of pizza dough to play with, but we missed out on the dough because we called ahead to order. Bummer. Our food arrived in good time — a pasta dish for me with fresh vegetables in a white wine and garlic sauce, and a pepperoni pizza for Kevin and Oliver. Oliver ate a whole slice of pizza — quite an accomplishment for him. Kevin and I both enjoyed our meals, and we got attentive service despite the crowd. We asked for the check early, and I was able to take it to the register to pay, which eliminated further wait time. As we left, we found ourselves at the pizza station again, and one of the workers handed us a small ball of dough. You would have thought we'd been handed the keys to the city. Oliver was in awe. He played with the dough in the car and then at home for about half an hour. He didn't want to leave the restaurant, and he didn't want to stop "making pizza" and go to bed. Thanks a lot, Mimmo's. Seriously, thanks a lot. Family-friendly amenities: Kids' menu, early opening and off hours, high chairs and booster seats, quick and flexible waitstaff, waiting area with games, activities at the table (pizza dough to play with!). Oddly, the men's room has a changing table, but the women's room does not. Our bill for three: $35 + tip.